Some Doomsday Crazy With That Google Search? But what’s this? @Mactavish shoots me a tweet telling me to check out typing in “why will” to the Google Search box. As innocuous as it may sound, the auto suggestions are not. I mean, why the heck would anyone need the suggestion: “why will a carrot slice when placed in tap water for several hours become very stiff”? Kidding. Mary isn’t referring to stiff carrots, I think she might be pointing out the sheer amount of doomsday Crazy going on. Wow. Type in “why will” and you get “why will the world end in 2012”? How about typing in “why won’t” and get redirected here. We are all going to die, and google is in on it! 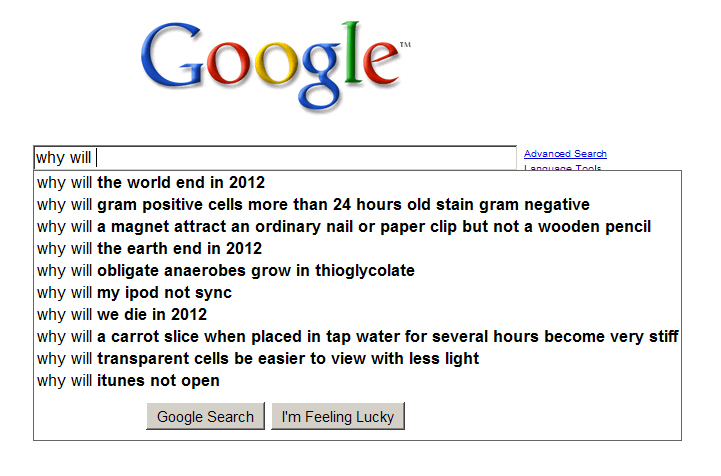 It really is a tad worrying that people will Google these questions, but aren't prepared to believe articles such as the ones you write explaining why the world isn't going to end just yet. very useful information thanks, just what i was looking for. I can guess the hard work it must have been required to research for this post. All what I can say is just keep providing such post, we all love it. And just to bring something to your notice, I have seen some blog providing your blog as source for this information. Besides, just to calm people down, I listened to a very interesting interview found by http://www.mp3hunting.com SE and learned that NASA does expect a particularly strong solar maximum sometime between 2010 and 2012, a solar maximum would be most notable for its effects on satellite and cellular phone communications. However, unless not being able to vote for American Idol for a couple hours is your idea of the end of the world, we’ll be fine. I did the “french military victories” thing, but it just goes to a domain that looks like google, but is not. Is this the intention? Lol, the search results are so different in 2010!! It’s just a movie, why so many people believe that? LOL that is funny 2012… what a crock that was just a bunch of hype to make people go see the movie 2012, then they’ll probably come out with 2013 Part 2 “oops our calculations where off by one year” when 20012 hit I’ll probably just be in my bunker looking for my cans of beans stash.